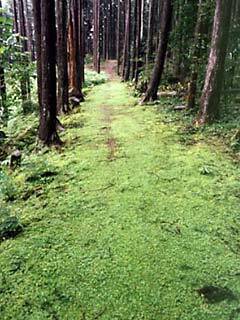 The three areas of Hongu, Shingu and Nachi were highly popular for religious adherents from ancient times to medieval times with so many people visiting Kumano that the travelers could be seen as far as the eye could see and were likened to a “trail of ants” making pilgrimage to Kumano. The Kumano Kodo is comprised of several routes including Tanabe to Kumano Hongu of the Nakahechi Route, from Tanabe along the coast to Nachi and Shingu of the Ohechi Route, and from Koyasan to Kumano of the Kohechi Route. With the broadening of the religious followers to sacred places, the Kumano Kodo as a pilgrimage route to Koya, Kumano, Yoshino-Ohmine has been maintained on a large scale, and at present, it is highly valued as a rich legacy of importance to culture for its greatness as a scenic landscape. 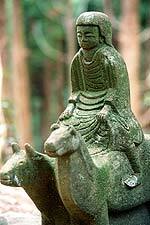 The "Sacred Sites and Pilgrimage Routes in the Kii Mountain Range," straddles the prefectural areas of Mie, Nara and Wakayama and has been established for its primacy as the "natural environment of the Kii mountain areas,” the “mountain peak sacred areas,” the “pilgrimage routes,” and the areas surrounding them and their “cultural scenery” as a valuable cultural heritage that is representative of Japan and can not be seen elsewhere in the world. Yu-no-mine, known as the oldest hot springs in all of Japan, is said to have been discovered around 1,800 years ago. 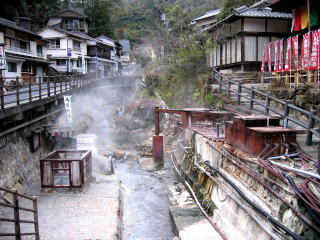 Even before the pilgrimages to Kumano, people are said to have relieved their tiredness from long journeys with the mineral deposits from the hot springs and rice gruel made with hot spring waters were said to have cleansed people’s tiredness both internally and externally at the venerable hot springs. At the point where the spring gushes out in the valley, there is a natural barrel-shaped tub, “Tsubo-yu,” in which it is said that the water changes to seven different colors in the course of the day. Recently, according to a certain magazine’s project, it has been chosen as “Kansai’s Number One Hot spring,” and many people come to visit.